FACT CHECK: Does a photograph depict a tramp steamer carrying Muslim refugees from Libya to Italy? Claim: A photograph depicts a tramp steamer carrying Muslim refugees from Libya to Italy. What the mainstream, leftist media do not show us. A tramp steamer leaving for Italy from Libya. And everyone on board gets accepted by the kind, loving, Politically Correct Europeans — who will soon find themselves overrun by people who mostly cannot speak the languages of host nations and have limited skills in areas needed by technologically advanced countries and thus can hardly contribute to the economies of their benefactors. Worse, a floodtide of the Muslim way of life is hereby being imported — by people who refuse to integrate into new societies they infiltrate but instead soon start demanding that their way of life, their beliefs and their laws prevail. The next step is a Muslim Europe. Origins: Global news coverage of the 2 September 2015 death of Syrian toddler Alan Kurdi prompted worldwide concern over the then-current Syrian refugee crisis, and in the wake of that event the message and images excerpted above began circulating. While refugees who arrived in Europe shortly after Kurdi’s death were openly welcomed by waiting crowds, expressions of sympathy for the plight of those making the trip caused some discomfort and debate in Europe. It’s likely the above-quoted e-mail resulted from that dissonance, serving as a warning for those who might think the temporary relaxation of border policies was without its drawbacks. With crowds numbering in the thousands in Vlora and Durres, harbor security forces apparently gave up trying to exercise control, allowing people to swarm aboard vessels and commandeer them for transport to Italy. Earlier today the vessel Ibridim radioed in midpassage, saying it was crammed with refugees and required assistance. Later, the freighters Tirana and Lirija approached Brindisi purportedly carrying a total of 6,000 Albanians, only to be told by Italian harbor officials to lie offshore until reception centers could be prepared. 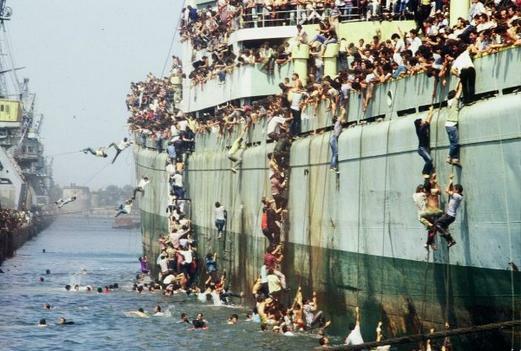 Twenty years ago, on 8 August 1991, several ships carrying approximately 15,000 Albanian migrants succeeded in entering the port of Bari, Italy. The Italian government’s response was harsh. Most of the Albanians were detained in a sports stadium without adequate food, water, or access to bathrooms. Italian authorities dropped supplies to the detained migrants by helicopter. Within several weeks most of the migrants were deported to Albania. Their harsh treatment was criticised by human rights organisations and the Pope, but was justified by the Italian government as necessary to deter further irregular migration from Albania. As for the claim that such emigrants “have limited skills in areas needed by technologically advanced countries and thus can hardly contribute to the economies of their benefactors,” the Albanian diaspora that began in the early 1990s saw about 45% of that nation’s academics leaving the country to take up residence elsewhere, many of whom have since returned to Albania.